Born and raised a Michigander, I'm used to change. Enduring weather of all varieties, often without warning, lays ground for an acceptance of environmental diversity. I believe this routine of change contributes to a need and drive for variation in my everyday life. Change in my routine, location, creative projects and job duties mold me into the go-with-the-flow person I was meant to be. An explorer, traveler, artist and writer. I received a formal education at Grand Valley State University, graduating in 2010 with a BA in photography and a desire to explore. I chose photography for my college major with no previous photo experience. An interest is all I had, and an eye for aesthetic balance. My first two years were entirely devoted to film and darkrooms where, ironically, I fell in love with the beauty of light. I learned the art of capturing and creating a mood and telling a story within a frame. Documentary photography slowly became my main passion and over my final year of studies, I completed my senior thesis on the moments I captured while studying in Africa. With a BA under my belt, nature and travel work are my main practices, today, though I do shoot the occasional portrait. Use the Contact page to inquire about individual print pricing of the work you see within this site. Traveling is a huge part of my life, as I now find it somewhat draining to remain so still. The country that first captured my heart and forever changed my life is Africa. In 2009, at age 22, I lived in Uganda and Rwanda for nearly 4 months. I roamed about each country as both a solo and group traveler, living with local families and learning about rehabilitation and reconciliation after horrific war and genocide. My next cultural immersion took me to India in 2011, where I volunteered in Jaipur. My plea for a home-stay was accepted and the organizers placed me with an incredible Rajasthani family for the month. My live with a local family "stipulation" took me to a different side of town where I became the only volunteer at a creative resource center, Bal Bhavan. I mainly taught english to children of the slums, but I also helped the center with computer related projects. In 2013, I visited a dear friend in Puebla, Mexico for the second time, touring pyramids and discovering my appetite for cactus. More recently, adventures have taken me around my own country... to Arizona, Washington, Oregon, Montana, Wyoming and South Dakota. In May, I'll be heading back to Puebla for a traditional Mexican wedding before jet-setting off to explore Switzerland for three weeks! Stay in touch! A self-taught jewelry designer and maker, I literally woke up one day deciding to craft my first piece. Without proper tools and findings, I cut and painted woven fabric, shaping it by hand and experimented with cheap wire. [Scroll down to see a photo of this project.] Today, jewelry making serves as another creative outlet. I make pieces for gifts, purchase and ...for myself (; Natural elements are often incorporated into my work, some giving a unique and worldly vibe while others hint of specific cultures. My first attempt at handmade jewelry. 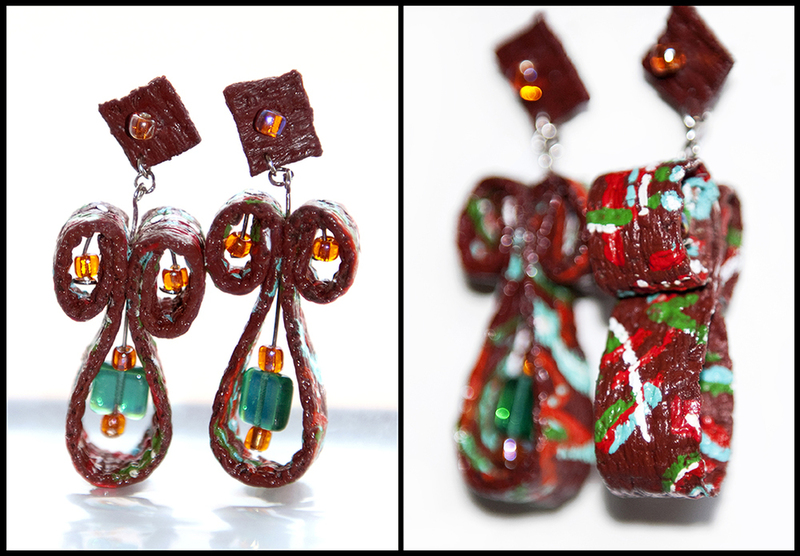 Well, besides friendship bracelets, that is (; Hand painted fabric, stud-dangles.